Grilled Chicken Aioli, Thyme for Cooking gourmet menus. The marinade is quite thick and adds lots of flavor to the chicken. It also protects it from drying out on the grill. It makes a nice presentation to slice the breasts, thinly, at an angle to serve. 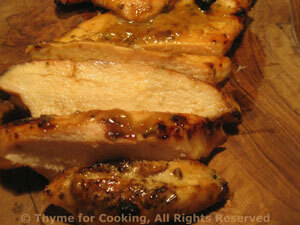 Spoon over chicken breasts and let marinate for 10 - 15 minutes - or longer, up to 45 minutes. Remove from marinade and cook on barbecue grill for 8 - 12 minutes per side or until done (test - take a peak). OR sauté in nonstick skillet for 8 - 10 minutes a side, until done. Everyone looks for new, interesting ways to use the summer abundance of zucchini. Combine it with pasta for an easy side dish, perfect with late summer grilling. Cook pasta according to package directions. When done drain. Add chili powder, onion and sauté 5 minutes. Add garlic, mushrooms and zucchini; turn heat to medium and sauté 5 minutes longer. 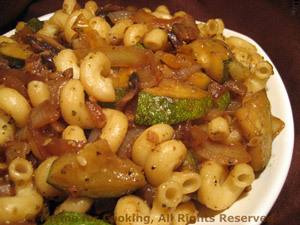 Add tomato, oregano, reduce heat and cook until tomato has softened and zucchini is tender, another 4 - 8 minutes. Stir in Worcestershire, soy sauce, pasta, combining well. Serve.